HERsteading is on view, this time at Brookside Museum, part of the Saratoga County Historical Society through August 1st. Brookside is a little gem of a museum upstate NY and it feels really right to have this show there. The more I mull over this series, the more I want to dive in deeper. For now, I added more captions, excerpts from Jenna’s writing that I feel reflect her life and message: find a way to live the life you desire most. Then, shine bright and strong. Don’t surrender or settle. …We need to help each other shine. We do it through memory and kindness, second chances, love and forgiveness. You don’t have to believe in anything to be part of those things. All of us can take a moment to think about what inside us needs to change, and who we love that we don’t want to let down, and to be grateful we’re still alive to do those things. I am so pleased to exhibit at Brookside Museum, thanks to the Saratoga Arts Art in Public Places program. The museum will be carrying the exhibition catalogue and the large gift cards from the series which are signed on the back by Jenna (Cold Antler Farm) and I! They are also available here if you can’t make the show in person. Sunday, June 11, is the Beekman Street Arts Fair in Saratoga (NY) and I’m really excited to be there again, sharing some brand new artwork. I’ve been experimenting with photo transfers on wood thanks to an upcoming public art project for LARAC (nothing like the incentive of a deadline to get you moving), and am having so much fun with it, i decided to just keep going. If you happen to be Upstate NY on Sunday, come one by (10am-5pm)! I could hug the organizers for putting me in between my two favorite food/libation places in town: Kraverie and The Local – I’m a lucky gal! There are over 50 artists with vendor booths (be sure to check out Grace Gunning‘s boxes and fellow photographer Greg Cuda); awesome food, music and great camaraderie. See you there! I love the title of this article by Christopher McDougall. I also love that images from my series Hersteading: Cold Antler Farm were chosen to accompany his words in the New York Times. It is a short and insightful article with depth–not easy to do because Jenna Woginrich, the girl that hunts with hawks, is such a complex renaissance woman. So grateful to Jenna for letting me photograph her world; there’s never a dull moment. To read Christopher’s full article in the NYT (you should), click here. If you would like to own the book from the Hersteading exhibition (you know you do! ), click HERE or the button below. It’s 38 pages of strength, struggle, sass and dedication. If you prefer smaller and sharable images, Jenna and I partnered on this set of giftcards, here. But by all means, if you love to read be sure to check out Jenna’s blog, as she is also the girl that tells stories. I need that photo of the hawk! Is that a REAL HAWK? Well folks, here’s your chance. Jenna (Cold Antler Farm) and I have joined forces again this Solstice to create a new set of 5×7″ gift cards. It’s a limited edition, and last year’s sold out fairly quickly, so go ahead and peruse your options in my new STORE. If you are looking for framed prints or want to see your options in person, head on over to LARAC, where I’m part of the Holiday Shop through Dec 24th (love how they take us procrastinators into account! Evening hours on Dec 22 too). I have work there ranging from $5 (cards) to $200 for larger framed photos. For matted prints, check out the Gift Shop at Saratoga Arts, also carrying my work – AND, the framed prints on view at Saratoga Springs Public Library are also available for purchase through them until December 31st. Oh, and I’m not done yet! The exhibition Sul do Brasil at Berimbau in NYC was extended until the end of January (and yes, you can have one of those too). Artist talk and slide presentation with Romais and homesteader and author Jenna Woginrich of Cold Antler Farm. Exhibition catalogues will be available for purchase and signing, as well as Jenna’s books thanks to Northshire Books. The Reception (7-8pm) features a delicious tasting from Bon Bon Brazil, with Druthers providing beer and yummies. A HUGE thanks to support by Saratoga Arts, Northshire Books, Druthers Brewing Co, Bon Bon Brazil, Canson Infinity and Archival Methods. Saratoga Arts has made part of this program possible with a Community Arts Grant funded by the NY State Council on the Arts with the support of Governor Andrew Cuomo and the NY State Legislature. Here I am documenting Jenna, a former vegan that now raises animals as food. Complicated? You bet. The food industry and its politics constantly feed us ideas (pun intended) about what food should be, or what it should look like. Our society –in the U.S. for example–is vastly disengaged from the reality of where our food comes from, how it gets to our tables. I am quite certain my image in the show (below) will be appalling to some – but it doesn’t change the truth that human beings consume living things in order to survive, and some of that happens to be animal meat. Jenna and I have spoken at length about this, and because she writes and blogs about her life – she has been questioned about this for years, sometimes aggressively (see Huffington Post article). Her switch back to eating and raising animals for food is her way of not ‘buying in’ to the factory farm industry which is horrid to animals, people and the environment. that causes less animal suffering and empowers my local community. If I take a step back and look beyond my backyard, I think of the deforestation in the Amazon that made way for cattle ranches (thanks McD‘s), and commercial crops that destroy the habitat of countless wild animals. Birds and bees fall prey to pesticides, and fertilizers are being made from petrochemicals. I had no idea that vegetables were such voracious beings although I often wondered about the “organic materials” and bone meal ingredients in plant food… then I think back a hundred years to what farmers did before current technology and practices. They had to use what was on hand, not some chemical imbued concoction. Being a vegetarian/vegan will remove oneself from participating in the factory farm cycle, but might not be an effective mechanism towards changing it (which was one of Jenna’s goals). Some people don’t have an economic choice and opt for processed food which are filled with chemicals, antibiotics, hormones, or steroids. Others will rely on packaged beef or chicken in the market without considering how it lived or died. Few are afforded a choice of where their food comes from, and I devour stories about urban gardens and programs that are teaching kids to grow their own vegetables. Cue young farmer, stage right. Maybe I tend to think about how food is made because of childhood memories on my grandmother’s farm, where pigs I knew as piglets eventually became the food on our table (and I also maaaaaay have named all the chicks after they hatched). Or maybe it comes from understanding hunger. Frederick Kaufman, author of Bet the Farm: How Food Stopped Being Food, says that hunger may be the most horrible symptom of the global food malady, but it is just one symptom. “The price of basic farm goods drives world hunger, but it also drives the push for sustainability, the rise of long-distance food from nowhere, the scourge of cheap and unhealthy foods, the single-minded drive to own the smallest molecules of food, the declarations and pledges of the politicians, the global mania for markets and the profit margins of many of the world’s largest corporations.” They very people that raise our food often can’t afford to keep it or their farms. Food choices in general, start with a personal preference but are so much more. I say “choices” deliberately, because food decisions are often based on hunger, not the privilege of choice. After all, “worrying about tomorrow can be a luxury if you don’t know how you’ll survive today.” Food is our nourishment, yet it comes embroiled with questions of ethics, socio-economics, geography and politics. I can’t help but respect the practice and ideology of raising one’s own food. A complex issue? Hell yeah, and one of the motivators behind creating this documentary (solo show coming this summer at Saratoga Arts). Until then, enjoy the exhibition and accompanying catalogue Nourish: Food as Sustenance & Pleasure, the 15th Annual Joyce Elaine Grant Photography Exhibition, curated by Dr. Rebecca Senf, Center for Creative Photography & Phoenix Art Museum. Click here for a list of participating artists. Some of you know that I have been photographing this amazing young woman that owns Cold Antler Farm in upstate NY, near the Vermont border. She’s the definition of moxie. Like many artists (she’s also a writer) Jenna Woginrich is making a go of it, doing what she loves. Which is why we came up with the notecard idea. The set of 8 cards are printed on archival paper, and are signed on the back by Jenna and myself. 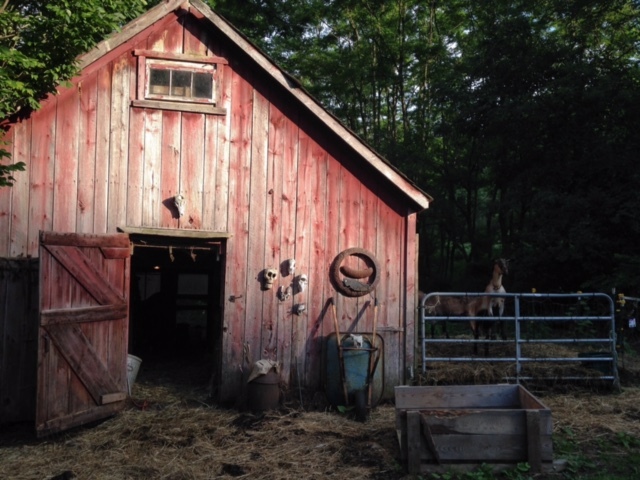 The images show the sassiness of some of her animals and the serenity of the home she has made at Cold Antler Farm. Those of you that have read her books or follow her blog will instantly recognize Merlin looking like a hairy mammoth with a snow-mustache, Ida giving attitude, or Sal with his Einstein-hairdo. Snag your set of cards while they last, and mail them to someone that deserves something a lot more special than a mass-produced hallmark card, gift the set (’tis the season! ), horde them for yourself or frame them! And if you want to learn more about Jenna, the geekiest down-to-earth techie-homesteader I know…check out her books and her blog. You can also follow her on Facebook, Twitter, YouTube and read her articles in the Huffington Post or The Guardian. Antlerstock 2015 is a small two-day Homesteading Festival held at Cold Antler Farm in upstate NY, on Oct 10 & 11th. It’s a great way to meet people and learn a lot! I’ll be there and will have some of my new work for sale. It s a celebration of like minds, music, stories and skills – a really unique learning experience with speakers, authors, demonstrations, workshops, talks and events such as beginner’s archery, raised bed gardens, and soap making as well as traditional woodsman skills and primitive crafts. Jenna is the gal to contact if anyone is interested in attending, there are only two spots left!